While it's usually grown as an outdoor plant, freesia can do well as a houseplant if it is provided with plenty of sunlight. The highly-fragrant blooms grow along the top portion of the stem, which grows up, then at an angle parallel to the ground. They flower from winter through spring, and must then be forced into dormancy until the following year's blooming period. Potted freesia bring color into the home while the winter chill is still outside. Fill a 5-to-7 inch container with well-draining potting soil. Choose a container with drainage holes on the bottom so the corms don't get overly moist and rot. Plant corms in late August. Space the corms 1 inch apart and plant them 1 inch deep. Plant so the pointed end of the corm faces the top of the pot. Water thoroughly until water comes out of the drainage holes on the bottom of the container. Dispose of the water collected in the container's drip tray so it doesn't water log the soil. Place the pots in a window where they receive full sun—at least six to eight hours daily. Supplement natural sunlight with artificial light, if necessary. As a general rule, plants require twice as much artificial light as they do natural sunlight. Maintain your plant until it flowers in late winter. Allow the soil's surface to begin to dry between watering and apply a liquid fertilizer when the flower stems emerge. Keep freesias in full light and a cool room when flowering; 50 to 60 degrees F is ideal. 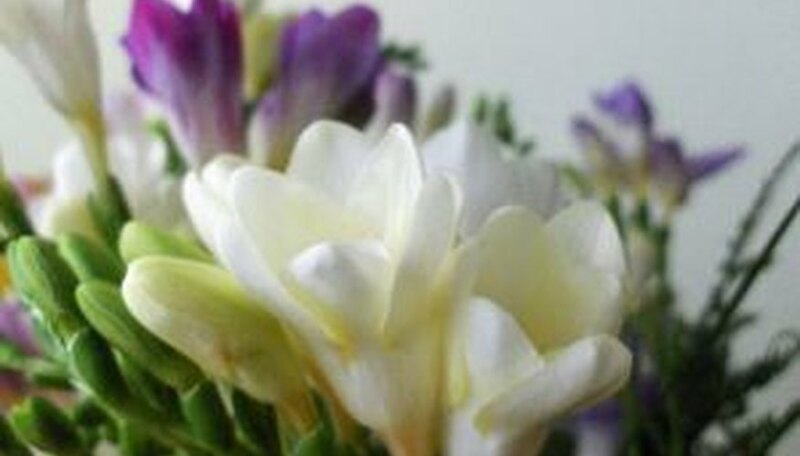 Consider moving the freesias outside during the daytime if and when the temperatures are warm enough. Allow the foliage to die back naturally, and allow the soil to dry out. Store the pots in a cool, dark place until the following autumn. Cut freesia flowers for arrangements. Cutting encourages further blooming from the plant. Stake the flower stems if they are weak or droopy, a common complaint of indoor freesias. Indoor freesia may not rebloom if they aren't later transplanted outdoors.